Lil Mynx is one of the original dance poles made for home use. The company that makes these poles - Pacific International Marketing and Promotions (P.I.M.P) was started by Lizz and Randy Blacker in 2002. They are based in California, USA and ship worldwide. That's Lizz in the photo at the top of the page. Lizz and Randy's company makes a range of removable dance poles, from basic one piece stainless models to a deluxe 2 piece pro pole that comes in a faux alligator case with all accessories. Prices range from US $199 - $399. Lil Mynx products have been endorsed by both Sheila Kelley (S-Factor) and Fawnia Mondey-Dietrich, who was one of the first professional exotic dancers to start teaching pole dancing. If you're installing your Lil Mynx dance pole on a carpeted surface you can use it as is. 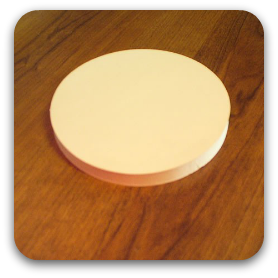 If you're installing on any type of hard flooring (laminate, linoleum, tile, etc) you will need to purchase a non-slip floor pad for safety. This is not optional. Trust me! Measure your ceiling. If it's less than 8 feet in height, Randy will make a custom pole that is short enough to fit, and there's no extra charge for this service. If you order without measuring, there's no way to cut the pole afterward without damaging the internal mechanisms, so it's important to have an accurate measurement before you order. All Lil Mynx poles come standard with a 12" extension so they will fit ceilings from 8' to 9' or 9' to 10' in height, depending on whether you choose the 8' pole or the 9' option. The pro pole is 8' in length and comes with a 12" extender. With this pole you also have the option to purchase a 2nd extension so you can install it on ceilings up to 10' high. If you have any questions about what height you should order, just send Lizz and Randy a quick email, or give them a call, and they'll be happy to assist you. Again, check your ceiling height before you order, just to be sure you don't end up with problems when you go to install your pole. Lil Mynx dance poles uses one of two basic mounting systems. All of the one piece dance poles come with a bolted ceiling mount (shown below) and are considered removable or semi-permanent poles. 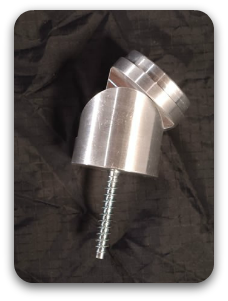 The mount requires one bolt into a ceiling joist, and once installed you simply place the top of the dance pole into the mount, make sure it's plumb, then tighten it into place by turning an inner slider tube. 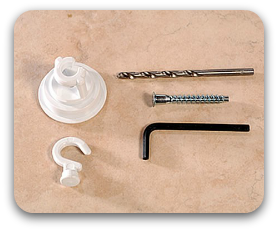 The mount itself is simple to install with a power drill, and Randy and Lizz even includes the correct size drill bit so you can't screw up the installation! Many people worry about drilling holes in their ceiling especially if they rent their home or apartment. However, the hole itself is relatively small, and is easily filled with a dab of spackle or Polyfil if you need to remove the mount later. It's no more difficult to repair than a nail hole for hanging a picture...really! The two piece Pro Pole comes with both the bolted mount, and a friction pad for a truly portable option. The friction pad still needs to be installed over a ceiling joist to be sure the ceiling can withstand the pressure, but it does give you the option of easily setting up your Lil Mynx pole in a variety of locations. Caution: while easy to install, as there is no drilling required nor tools needed, the friction pad is inherently less secure than the bolted mount. If you need to know more, you can read about the pros and cons of friction fit poles here. One of the things many people like about Lil Mynx poles is the fact that they come in a variety of colors. 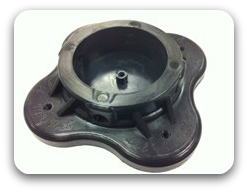 The basic one piece unit is available in black, pink, and red, as well as stainless steel. There is also a Rotator (spinning) pole available in these same colours, as well as in stainless steel. The Lil Mynx spinning model converts easily to a stationary dancing pole just by adjusting a locking pin, so they are just like having two poles in one! If you have smaller hands, you can now order any of the one piece poles in the petite size at no extra cost. While a standard pole measures 2" in diameter, the petite model is 1.75" which means smaller hands can get a better grip for spins and climbing. Previously you could only get a stationary, stainless steel pole if you wanted the petite model. This is a recent change at Lil Mynx that's sure to be appreciated by those who need or want a smaller diameter, but don't want to give up their other options. The Pro Pole (pictured below) is a two piece portable pole that comes apart for easier storage. This kit comes with a bolted mount, friction mount, floor pad (necessary for use on hard flooring), stud finder, tape measure, grip ring (for tightening the dance pole more easily) and all required installation hardware. It all comes packaged in a faux alligator case for easy portability. Another Lil Mynx exclusive is their wake poles. These are removable dance poles for your ski boat! Each wake pole is custom cut to fit your boat, and is available with a variety of mounts to accommodate most ski boats. These exclusive and unique poles are even available in a 2 piece model, and can be ordered with a case for easier storage on board your boat. They're available in stainless steel, or in black, red or pink powder coated finishes. It comes apart in two pieces so it's a manageable size when broken down. The entire assembly, including the case, is not too heavy for most women to carry. In comparison to the Platinum Stages Super Pole, the Lil Mynx model is much lighter, yet every bit as durable. Because there are only two pieces, it's quick and easy to assemble. Just slip the two pieces together, pop the friction pad on top, and you're ready to install it. Lil Mynx's one piece pole is not technically classified as portable, although this type could be moved if another mount were installed in each location you wanted to move it to. The one piece dance poles are 8-9 feet long however, so in practical terms, they are not easily transported. Currently, Lil Mynx dance poles range in price from $199 - $399. The most economical model is the 8' one piece colored pole at $199, while a colored spinning dance pole is $249. One piece stainless steel dance poles are $249 for the basic, and $299 for the stainless rotator. The Pro Pole is the most expensive option at $399, but well worth it if you need the portability and ease of storage. All Lil Mynx poles, with the exception of the 2 piece pro pole, can be ordered in the petite size at no additional charge. The standard height is 8' with 12" of height adjustment, but if you'd like a 9' pole (also with 12" of height adjustment), it will only cost you an extra $20. NOTE: Prices and shipping fees can change over time. To ensure you get the most up to date information, please visit Lil Mynx's pricing page and the shipping info page. Shipping is offered worldwide via FedEx, although customers outside of the US and Canada may find the shipping costs prohibitive. Delivery of my pole to Canada took just under a week, and the process was smooth and simple, as the company includes the brokerage fees in their shipping fee (though not customs fees or duties). If you live outside the US you may want to find out about these additional duties before ordering, so you're not surprised when your shipment arrives. Every Lil Mynx pole comes with a one year warranty against manufacturer's defects when used and installed as directed. 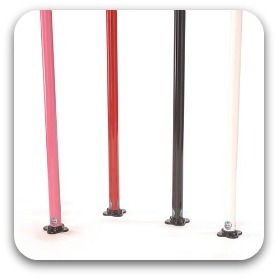 Poles used in commercial applications (studios, rentals, etc) are covered for only 30 days. You can read full warranty details here. In my experience, Lizz and Randy know what good customer service means. When I received my first pole from them, I called to ask what I thought must be a really stupid question. Randy was very patient and helped me get everything set up and installed quickly. Later, when I had a problem with one of the commercial dance poles in my studio, Randy diagnosed the issue over the phone. And then, going above and beyond the call of duty, he shipped me some replacement parts free of charge, along with a custom made tool and instructions for repair, even though my equipment was long past the 30 day commercial use warranty period. Once I had the parts and the tool, it was an easy fix and I felt rather proud of myself for being able to take care of it all by myself. Well, with a little help from Randy of course! Is the Lil Mynx dance pole the right choice for you? If you decide to order a Lil Mynx pole, and you found the information on this page helpful, please consider ordering via any of the links on this page, including this one. Pacific International Marketing and Promotions.